The Cinema Our cinema projectionist, Jim Makin was on hand to display the title screen from each of the films to add a little “eye candy” to the event and this again was a very nice touch. A good sized audience viewed two of the best films. A 1967 production of “Looking Back At George Formby” featuring one of George’s acting colleagues Gary Marsh. This documentary and “The Friday Show” which was also shown had both being digitally restored. The “Friday Show” is generally thought to be Formby’s finest moment when the man himself took us briefly through moments of his sadly short life. 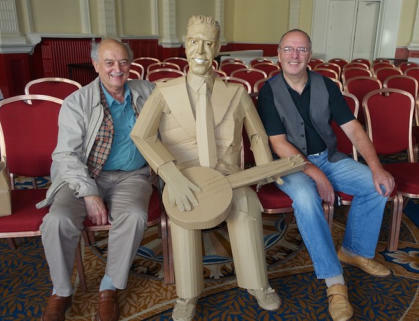 One welcome but unexpected guest for the weekend was “Cardboard George” who appeared courtesy of Neil Forshaw. “Cardboard George” enjoyed the best seat in the house to watch the the Saturday show and was then the subject of fierce bidding in Gerry’s Saturday evening auction and was eventually given a new home when a winning bid of £40 was accepted from one of our always generous members. that our regular September visitors from California, USA, Terry and Marie Tucker and Bill and Sue Kornik had to pull out of making the trip over at the very last minute owing to health issues suffered by Terry. We have enjoyed the company of these long distance travellers for quite a few years now and we were all very sorry that the trip had to be cancelled. I know that I speak on behalf of all who know Terry within the GFS when I say that we all wish you a speedy recovery back to good health. 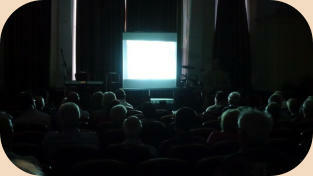 Annual General Meeting On Sunday morning the first event of the day was the 55th annual general meeting. The existing committee members all stepped down and were re- elected. There were two committee places available and has there was only one application for each position, no vote was necessary and therefore Neil Forshaw and Lewis Clifton were voted unopposed. Lewis might be a “new face” to the committee but he is very well known within the GFS and has been the archivist for the last three years. Both Neil and Lewis are very welcome. Lewis at 18 years old is probably the youngest committee member in the Society’s history. Volunteers The convention weekend obviously needs a lot of planning and whilst this always takes place at a meeting prior to the convention weekend, we also need many volunteers to help things run smoothly. Taking names for the concerts is a thankless task but we always have a loyal band of members who will put themselves forward. We are grateful to all those who give up their leisure time to ensure that everyone present has an enjoyable time. The band, MCs, people who work the audio equipment, shop assistants, people who sell raffle tickets, people who man the reception desk, photographers and the the cinema projectionist, people who manage the stage, there are so many members and committee members that are needed to make the weekend work, it does not just happen! The committee could not do all this on their own and are always grateful that we have willing hands to back us up. A big thank you goes to one and all. Coming shortly In November we get another chance to do something a little different when we celebrate the 65th anniversary of the hit show “Zip Goes A Million” when some of the songs will be performed and John Walley will tell the story of how George Formby became the hit of the West End, it should be very interesting! Mawdsley), John took us through each of the twenty films with little anecdotes and provided vital but very entertaining information before each performer took to the stage. Ukulele Raffle Unfortunately the winner of the ukulele raffle could not be with us but we offer warm congratulations to Mr Geoffrey Pearson who’s winning number (16604) was pulled out of the drum by Kathryn and Gerry. I can tell you Mr Pearson, you have won a lovely instrument which has been set up by the one and only Eddie Uttley. I had the privilege of having a little play on it shortly before the draw and it is a beauty! One sad piece of news was that our regular September visitors from California, USA, Terry and Marie Tucker and Bill and Sue Kornik had to pull out of making the trip over at the very last minute owing to health issues suffered by Terry. We have enjoyed the company of these long distance travellers for quite a few years now and we were all very sorry that the trip had to be cancelled. I know that I speak on behalf of all who know Terry within the GFS when I say that we all wish you a speedy recovery back to good health. 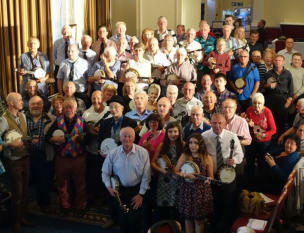 Annual General Meeting On Sunday morning the first event of the day was the 55th annual general meeting. The existing committee members all stepped down and were re- elected. There were two committee places available and has there was only one application for each position, no vote was necessary and therefore Neil Forshaw and Lewis Clifton were voted unopposed. Lewis might be a “new face” to the committee but he is very well known within the GFS and has been the archivist for the last three years. Both Neil and Lewis are very welcome. Lewis at 18 years old is probably the youngest committee member in the Society’s history. Volunteers The convention weekend obviously needs a lot of planning and whilst this always takes place at a meeting prior to the convention weekend, we also need many volunteers to help things run smoothly. Taking names for the concerts is a thankless task but we always have a loyal band of members who will put themselves forward. We are grateful to all those who give up their leisure time to ensure that everyone present has an enjoyable time. The band, MCs, people who work the audio equipment, shop assistants, people who sell raffle tickets, people who man the reception desk, photographers and the the cinema projectionist, people who manage the stage, there are so many members and committee members that are needed to make the weekend work, it does not just happen! The committee could not do all this on their own and are always grateful that we have willing hands to back us up. A big thank you goes to one and all. 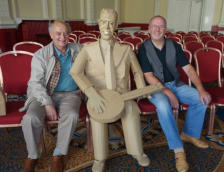 Coming shortly In November we get another chance to do something a little different when we celebrate the 65th anniversary of the hit show “Zip Goes A Million” when some of the songs will be performed and John Walley will tell the story of how George Formby became the hit of the West End, it should be very interesting!